Caregiverlist offers these 1-page training briefs to assist you in providing quality care to your senior clients. These briefs are not meant to replace caregiver training programs, but are offered as convenient refreshers on common medical conditions and senior care needs. Read or Print and Take Along as Reminders when Providing Senior Care. 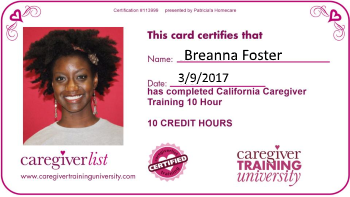 Caregiverlist Certified Caregiver training provides a 8-hour online training program for non-medical caregivers.